It was a night of heated tension as Manchester United came from behind only to gift West Ham two goals in the space of five minutes which allowed them to leave their home for the last 112 years on a high. The evening started badly for the Red Devils even before the match had begun when their team bus came under attack on the way to the stadium. An event that could have shook the players confidence even before they had entered the ground. However, no excuses can be made for the way they squandered the lead after Martial’s double had put their noses in front. This was the first of two important matches for the Red Devils in their season finale that would determine if their quest for a top-four finish would indeed materialise after another fairly disappointing season. The target was clear win the last two games and they would secure a Champions League place at the expense of Man City. There could have been no greater incentive. Louis van Gaal’s starting XI had a strong look about it: De Gea, Valencia, Smalling, Blind, Rojo, Schneiderlin, Herrera, Mata, Rooney, Rashford and Martial. Van Gaal made four changes by bringing back Blind, Schneiderlin, Rashford and Martial, who had been a doubt after pulling out in the warm-up against Norwich. The match was delayed for forty-five minutes to allow Man United more time to prepare for the game as their team bus was late arriving at the ground due to the mass of home fans outside the stadium. Fans decided it would be fun to pelt the United bus with various objects including beer bottles and probably jellied eels as it was the East End. Once the match got under way it became abundantly clear that not only did United have to overcome the opposition but also the partisan home crowd if they were to come away with the victory. Immediately following the kick-off West Ham bombarded United’s penalty area and in doing so created panic in the away defence. Martial didn’t seem to be hampered by injury as he burst into the box in the opening minutes and was unlucky not to be awarded a corner. It was not the start United wanted when the Hammers took the lead in the tenth minute following a cross from the left that found Sakho unmarked in the box and his effort was deflected by Blind past the despairing dive of De Gea to give the home fans more to shout about. This was proving to be a match that would truly test the characters of the United players as they were in a cauldron of hate pouring down from he stands. 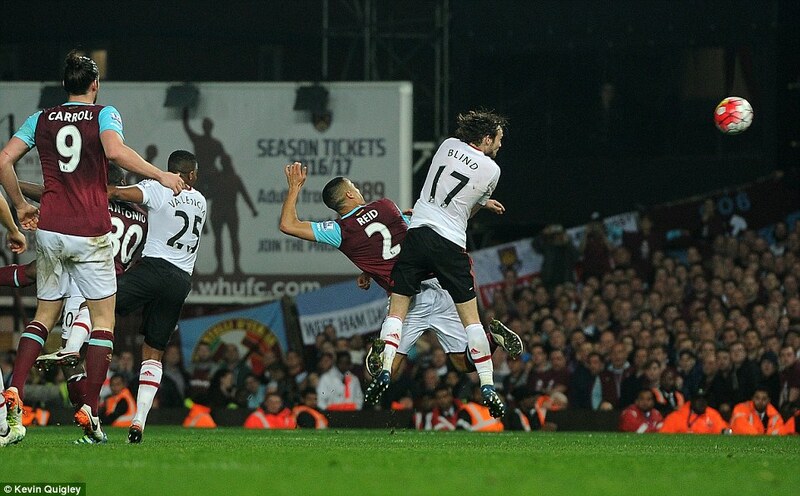 West Ham had a perfect opportunity to double their lead when Carroll was played clean through but with only De Gea to beat he placed his shot too close to the keeper who managed to get a block in and save Smalling’s embarrassment as it was the defender who lost the run of Carroll. The ball was in the United net again in the twenty-first minute but thankfully for United, the goal was disallowed as it had already crossed the line for a corner. As the half hour mark approached United finally started to put some decent passes together and created some space on the flanks but were let down by the final ball. On one such attack Valencia and Martial linked well on the right and when the cross was played over Mata was adjudged to have fouled a defender as he headed goalward. After a rare mistake from Martial, who slipped while in possession, Payet was gifted a golden chance but he totally miscued his shot and it curled harmlessly wide. At the other end, Rashford tried to get on the end of a pacey Rooney cross but the youngster seemed to mess up his jump and the chance was gone. As the half neared its conclusion it was the home side who were on the front foot and had plenty of chances to put the game beyond the reach of the visitors. 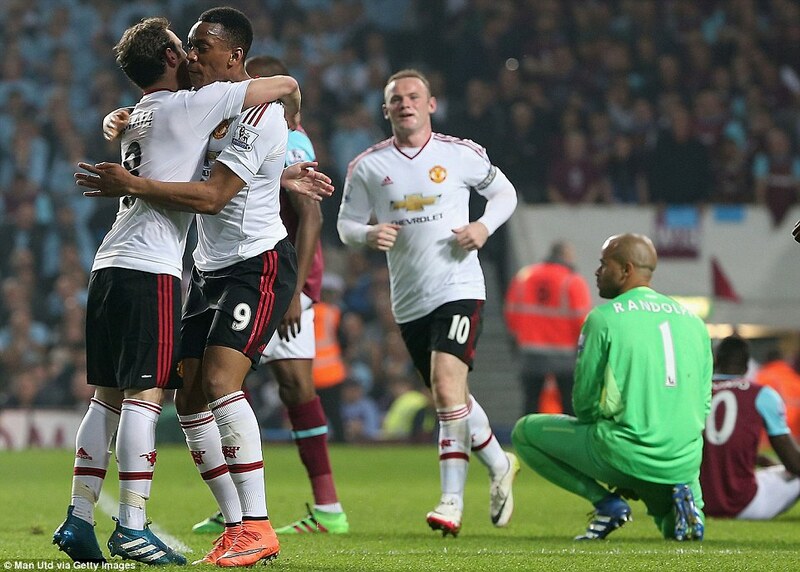 There was a late shout for a penalty after Martial was nudged as he sped into the penalty area. However, Mike Dean immediately waved away the claims from the United players. Half-time and behind to only a single goal meant that in the second half United still had to hope they could overturn the score. The biggest problem in the first half was that United weren’t allowed to settle and when they did have the ball they didn’t seem to know what to do with it. The most creative player for United had been Rooney, who in his deeper role tried to pick out the runs of his forwards and was unlucky on a couple of occasions that his passes hadn’t been as pinpoint as usual. United got the second half underway looking for a vastly improved second forty-five minutes compared to the first. 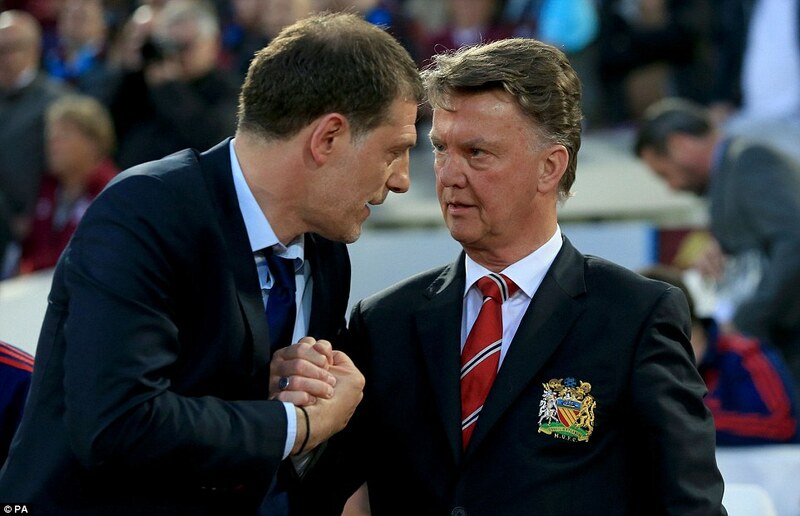 Van Gaal made his first change at the start of the half when he replaced Schneiderlin with West Ham old boy Carrick. In the 51st minute, the home fans failed to return the ball to De Gea from behind his goal so a replacement ball was called for. From De Gea’s goal kick the new ball eventually fell at the feet of Mata who showed great awareness inside the area to cut the ball back from the byline and his pass was swept home by Martial to make the scores level. Superb play by Mata to create a chance out of a long punt by his keeper. Bet the home fans wished they hadn’t delayed play by not returning the ball. Unfortunately, Martial followed up his strike with the first booking of the match. United were looking more dangerous in attack as Rashford tried a cheeky backheel across the six-yard area that Herrera was unlucky not to get on the end of. The Hammers still provided their own threats on United’s goal and in one attempted header by Carroll it took a goal line clearance by Rashford to save a certain goal. As the match entered the last twenty minutes tackles flew in left right and centre and there were two cautions in quick succession for Carroll and Valencia. Then in the 72nd minute, that man Anthony Martial scored his second of the game and 17th of the season to put United into a 2-1 lead. The move began with Rooney who played the ball through to Rashford who in turn passed to Martial on the left-hand side of the area. The French forward still had a lot of work to do as he dribbled his way into the box then from a tight angle clipped the ball into the net. A brilliant finish from a player on top of his game. 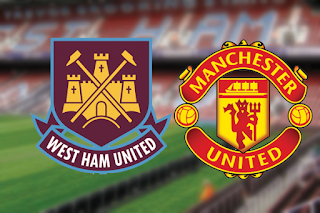 After the jubilation of the equaliser, West Ham pressed United back and then turned the game on its head with two soft goals both headed in from close range by Antonio and Reid that stemmed from a couple of set pieces delivered by Payet and poorly defended by the United back four. The last fifteen minutes were played out against a crescendo of noise generated by the home fans around the ground. They must have been loving the fact that they had got one over United. 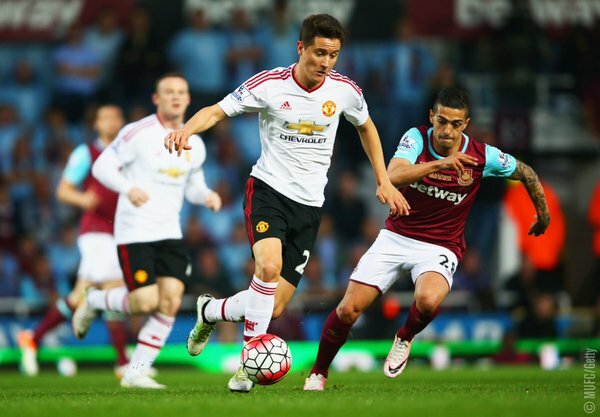 Herrera was substituted after he had been cautioned and was replaced by Lingard for the last five minutes. The last change by van Gaal was to introduce Januzaj for Valencia to try and rescue at least a point from the game which they failed to do. Game over and United headed back up north licking their wounds knowing that they had blown a great chance to come away with a win but instead fell to their tenth defeat in the league. From the start West Ham went for the throat fired up by the occasion with the backing of their fans behind them and United seemed to take an age to settle especially at the back. Everybody knows what a danger Payet poses at dead ball situations so why on earth did the United players continue to concede free-kicks in dangerous areas? Once Martial had provided the lead United imploded in the space of five minutes with a display of inept defending and only have themselves to blame. Now the advantage has been handed back to Man City who have to win away at Swansea while United host Bournemouth in the final games of the season. The Swans are not a push over so expect a few more twists and turns during the last ninety minutes of the current campaign.